Pick Analysis: While only ranked as a two-star prospect from Texas, Lawler's first-team all-state selection (124 tackles, 28 tackles for loss, 13 sacks; 44 catches, 719 yards, 11 touchdowns receiving) portended a good career at SMU. The former high school powerlifter was ready to play right away, earning time in all 12 games as a true freshman (23 tackles) and getting some time on offense (three-yard touchdown, two-point conversion). Lawler earned the starting job as a sophomore, lining up for every game and leading the Mustangs with 64 tackles, nine for loss while compiling five sacks. His break-out season came in 2016, garnering first-team All-American Athletic Conference accolades, racking up 65 stops and leading the team with 15 tackles for loss and six sacks. Lawler received first-team all-conference recognition as a senior, as well, racking up 74 tackles, 15.5 for loss, 9.5 sacks, two forced fumbles, and three blocked kicks for the Mustangs. 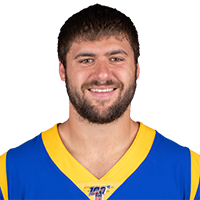 Published: April 28, 2018 at 06:27 p.m.
Los Angeles Rams fan Jaime Baca announces the team's selection of SMU defensive end Justin Lawler No. 244 in the 2018 NFL Draft.